« Let’s Party Mondays: Start Your Engines, A Car Party! I had a few final thoughts on last week’s party theme: Camp. But, things got a little away from me at the end of the week (one of my classic apologies), so let’s pack it up. I had to see if my faux fire idea would work — that is attaching tissue paper to a fan. I’m all about theater and I made this nifty video on some software I found on my computer. I’m not willing to admit defeat. The staff is not deeming it a true success. And Mr. Party MOMster is just a little worried. That’s it for my foolin’ around (for now). 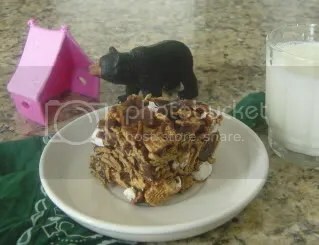 Scary bear in the S'mores picture!! I am wiping the tears from my eyes as the opening song to Meatballs ends. Kudos to you for such a great movie reference. Someday our kids will appreciate it too! I am so pleased to hear some love for the movie. I haven't seen it in awhile. I just searched and Meatballs II is on Comedy Central next week, which is the equilavent of The Godfather III as far as I'm concerned. I am declaring a "Meatballs watch" — if it comes on TV please alert me. Oh, and the bear was keeping watch on my s'more, so no one else would eat it. Kind of a "Leggo my Eggo" — touch my s'more and this bear will maul you. That s'more has my eye and I can't get past it. I want it. Good thing the bear is watching it for you. I am going to have to try the s'more recipe. I just love the real thing and this looks just as delicious. Printing the recipe now!